The durian season lasted longer this year. Prices dropped due to oversupply. This is great news for durian lovers in Malaysia. There is a Malay saying : "Durian runtuh, sarong jatuh", which means when durian falls, the sarong falls as well (as people would pawn their sarong in order to buy durian). I for one is a big durian fan. It is definitely the king of fruits for me. Unfortunately, the prices soared and this fruit has become too pricey or you could even consider certain species (Musang King...) as luxury fruit. Oh I miss savoring durian at those all you can eat buffet durian store with friends and family. In France, we can buy frozen or whole durian but they are expensive and less tasty (imported from Thailand). 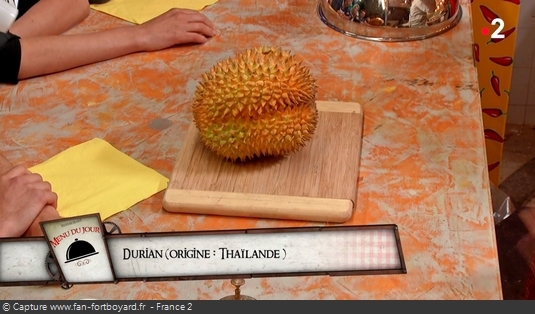 I was watching Fort Boyard (French Amazing Race) the other day, they were at the "eating awful thing moment", it was then I wonder if they would put durian as awful thing to eat. And bingo! The chef introduced durian to the contestants and asked them to eat durian puree. I was like, let me eat all of them! Most of the contestants puked, they had to close their noise with their fingers before eating. This shows how much your environments shape your tastes.